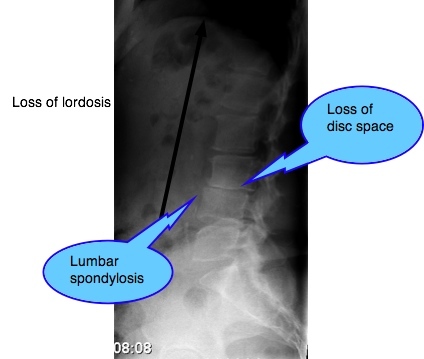 Lumbar spondylosis casefile is a complex patient with back, groin and thigh pain. This jawbreaker word basically means wear and tear in the joints of the spine. The term describes the osteophytes, or bony outgrowths that emerge from the vertebral bodies of the lower back. 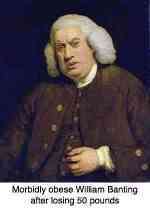 Thus, to an extent, in the older person, it is a not unexpected or unusual finding. 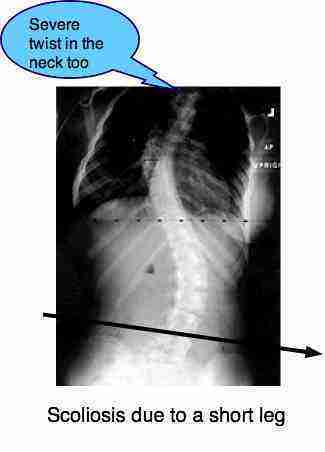 They are usually asymptomatic, but give an indication of a spine that has been under stress. They grow to stabilise the back. Only in some people, for one reason or another, it is greatly advanced causing gross changes sometimes affecting the nerves as they exit between the spinal joints, especially when they grow out from the posterior margin of the vertebral body. This is a stock photo, not from the patient below. 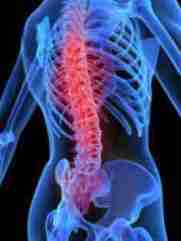 A sixty-two year old woman has had lower back pain for five years. Two years ago pain began on the side of the hip. Within a few months she started to experience groin pain, with a radiating pain down the front of the right thigh towards the knee. 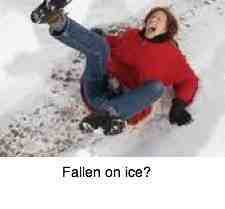 Walking became difficult and painful, both dawdling as when shopping, and when trying to go for a walk. She was unable to garden, her favourite hobby. Anti inflammatory drugs brought temporary relief. Treatment by another chiropractor and by a physiotherapist helped only marginally. Exercises aggravated the groin pain. 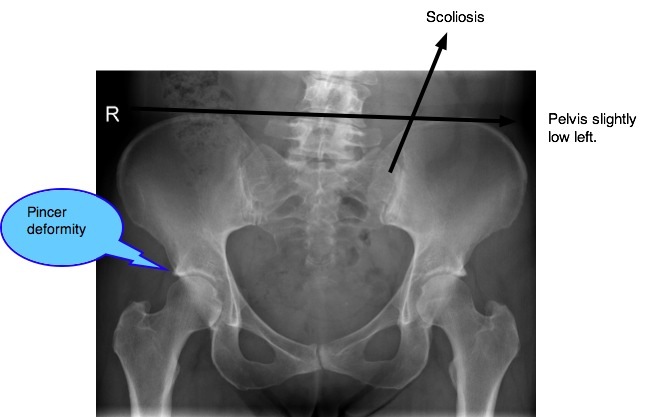 On observation, she clearly had a marked scoliosis (spinal curvature) but no obvious short leg. 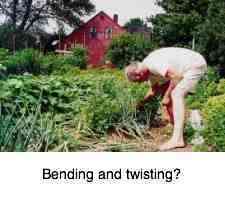 Forward bending caused mild-to-moderate low back pain, and no pain in the leg. Exension of the spine was rather more painful, but neither caused leg pain. The Sciatic nerve (which comes from the LOWER lumbar spine) stretch test was negative, but the Femoral nerve (UPPER lumbar spine) stretch test was strongly positive with pain in the front of the thigh. There were no abnormal sensory or muscle weakness signs. The achilles reflex (S1) was zero. Sacro-iliac orthopaedic tests were negative. Flexion of the right hip caused groin pain, but internal and external rotation were relatively normal. 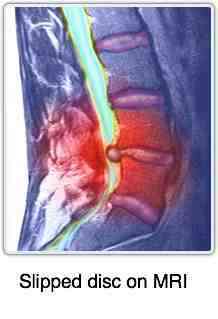 No sacro iliac joint fixations were found, probably because of the previous chiropractic treatment. There were marked L1 and L5 fixations on motion palpation. Flexion fixation of the right hip was found. Active trigger points in the Quadratus Lumborum, Pectineus and Adductor Magnus muscles were located. A 3mm heel lift in her left shoe markedly improved the spinal proprioception test. Solving a back problem is in some ways like a game of su doku. Having gone thoroughly through all the basics, one has to start looking for triplets and uniques. Often they are obscure and there may be diversions that only lead down a cul de sac. 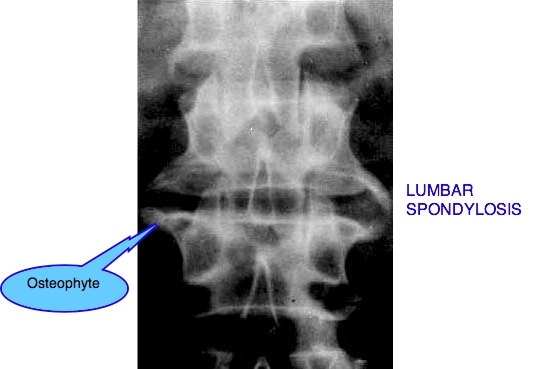 One such cul de sac was the lumbar spondylosis seen at L3. The joint looks horrid on the Xray, but clinically proved irrelevant. Clearly this was an acquired condition, whereas the Pincer deformity is congenital. But they correspond neurologically, both to the Femoral nerve. It's my opinion, that a hip condition, either neurologically, abnormal muscle tension, altered gait can actually cause the lumbar spondylosis, but this actually chiropractic heresy. Is it vice versa? Slightly short left leg (too small to be detected by simple observation but seen on X-ray (think leg length inequality ...). Pincer deformity: Femoro Acetabular Impingement syndrome. 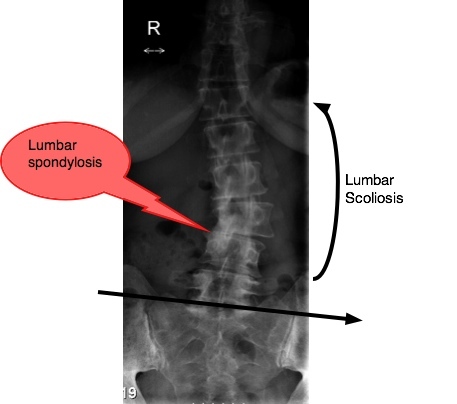 Lumbar spondylosis. Actually an irrelevant, incidental finding. Chiropractic adjustments of L1 and L5. Mobilisation of the right hip. Active release technique on the active trigger points and the hip joint capsule. 3mm heel lift in left shoe. Vigorous appropriate active rehabilitation is vital to long term success. We should not forget that one of the vitamin C deficiency symptoms is poor scar formation. Some conditions are bastards and take weeks and even months of struggle on the part of both patient and chiropractor before there is significant improvement. This lady unexpectedly responded positively within the first two weeks. Now, after six weeks, she has almost no pain, and can walk normally. The key point in her case were to grasp that it was a multi factorial case. As we say in Chiropractic education, remember the patient can have two diseases. Radiating nerve pain from a high lumbar subluxation, called Maigne's syndrome. Appreciating that we were dealing with a latent Femoro Acetabular Impingement Syndrome FAIS. What completed the picture was the heel lift. Because the leg length deficiency was so marginal, I refrained from providing a foot orthotic in the first few weeks. But the correction of the short leg, reducing the scoliosis and balancing the pelvis, brought even better positive results. All in all a most satisfactory outcome. She now comes in every six weeks for maintenance. If possible I hope to extend that to eight or ten weeks. She does her exercises faithfully. For a woman of 62-years not to be able to walk easily and freely, is not only painful and disabling. By failing the TEN SECOND STEP TEST her life expectancy was also being cut short. Why? Many reasons but one obvious one is that, not being able to enjoy all the walking benefits, she was failing in one of the prime causes of osteoporosis. Lack of exercise.This however was not a neurological abnormality, but an inability to easily flex the hip. After treatment she could perform the test quite normally. The Pincer deformity is just as evident in the left hip. Why only right thigh and groin pain? It's hard to be sure, but I feel the irritated high lumbar nerve, and the short leg are probably behind it. 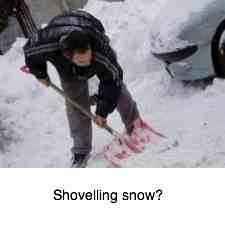 Only a dedicated research programme can sort out these mysteries. 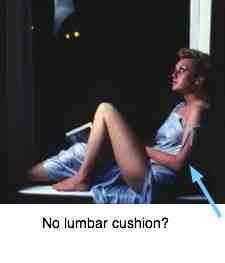 Why the loss of the S1 (lower lumbar) reflex? 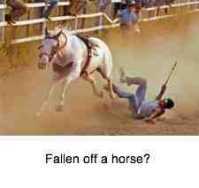 Probably an old injury, reflexes often do not return. This was not an S1 sciatica, but the subluxation at L5 was (in addition to L1) an important part of the overall treatment. Many medical people believe that a short leg less than 10-15mm is not significant. I heartily disagree, but that too needs to be researched.